Congrats to the 16 National team! AYHL Champions! Ross Colton, Mercer Chiefs player, signed to the Tampa Bay Lightning in the NHL! The Mercer Chiefs organization is thrilled to announce that the Mercer family is now owners of a USHL franchise. Ice Land and Mercer Chiefs General Manager Rob Broderick said, “This is a game changer for the Mercer Chiefs hockey club. USHL is the best Junior League in the country, the only Tier One Junior League in the United States. The Chiefs are now part of an organization with an NAHL team, a EHL team and now a USHL team. The Chiefs players will have the opportunity to play for a great program from Mites through the two best Junior programs in the United States. This is a very exciting day for the Mercer Chiefs!" Chiefs Hockey Director Chris Barclass said, "This is a great day for the Mercer Chiefs family. Now the Chiefs organization has the EHL, the NAHL and the USHL as options for our top Tier One Midget Players." A big congratulations to Coby Auslander and Chip Hamlett for being drafted by the Boston Bandits. Coby and Chip are both on the U18AAA Premier team for the 2018 season for the Chiefs. "Two terrific players, the Bandits picked two gamers. Coby was taken first overall in the draft. "He is a smart, talented forward and Chip is a solid two way defenseman. They are both solid on both sides of the puck," said Mercer Chiefs U18 Coach and GM Rob Broderick. Congrats Coby and Chip! 2019 16 National AYHL Champions! 2018 U15 Atlantic District Champions! The Mercer Chiefs excited to announce Robert Broderick as the GM. Mercer Chiefs proud to announce Hire of Dan Pressl as U15/16 Coach. Click Chiefs logo above to register for the Mercer Chiefs 2019-20 Tryouts! Click logo to go to the AYHL website! *Game day uniforms not included in price. Coaches expenses are included - no extra hidden fees! Click to register for Chris's Summer Camp! The Mercer Chiefs competitive hockey program offers a structured and disciplined venue for children up to the age of 18 to participate in a highly competitive travel hockey league. The program is selective in matching a child’s physical ability and skill level with the appropriate level of competition and developmental options. 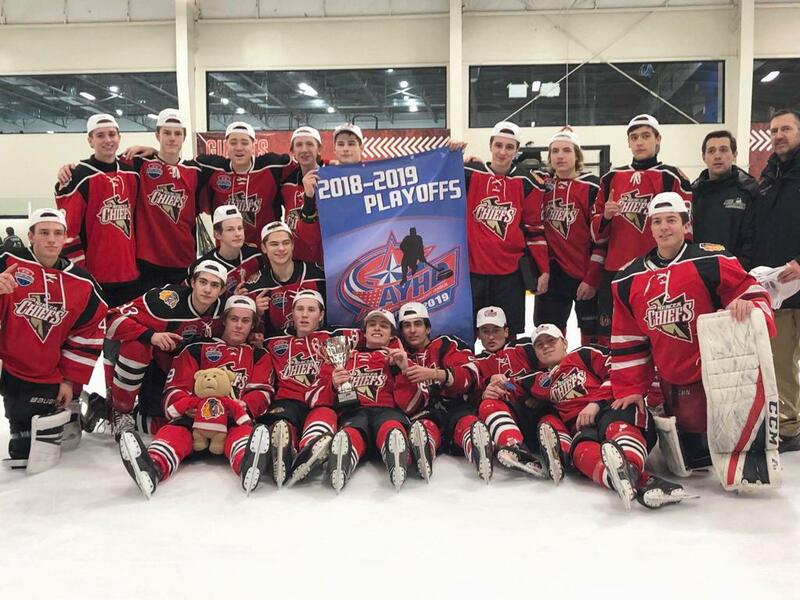 The Mercer Chiefs Tier 1 AAA teams offer the highest level of competition both regionally and nationally and compete within the AYHL and at high-level tournaments throughout the country. Tier 1 hockey programs require a significant commitment from both the player and their parents or guardians with respect to practices, games, and tournaments and this commitment should be carefully considered before participating in the program. The rewards gained from this commitment are significant for all involved. 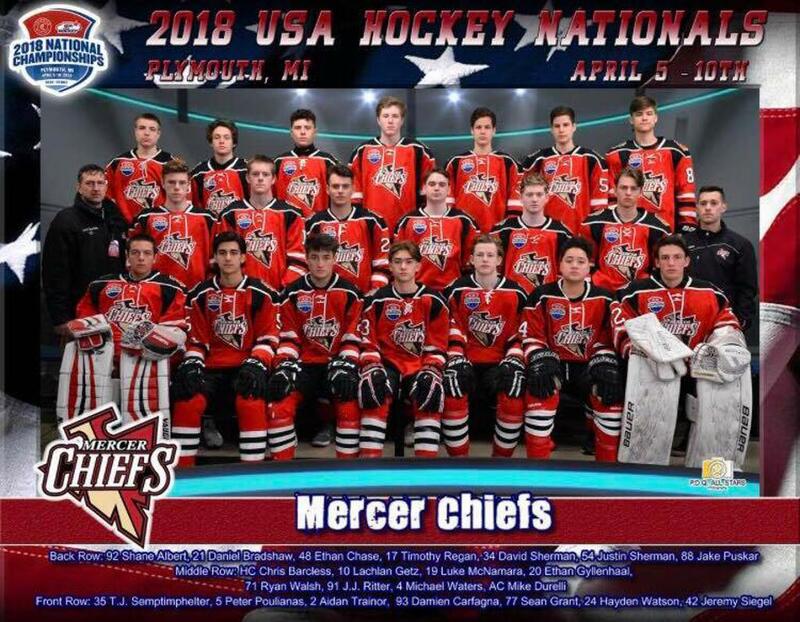 The primary focus of the Mercer Chiefs program has been and will continue to be on the development, competitiveness, and enjoyment of the player participating in high level athletic competition. Maximizing the amount of on-ice practices. Emphasis on fundamentals & skill development. Certified coaching staff for all practices. Pre-season Mini Camp in late August. Regular season begins in September and runs through March.